As an ideal tool for air quality studies, such as those required for most HVAC and other applications present within enclosed environments, the RFCO2RHTemp2000A data logger is equipped with a 16 ft cable. This cable is directly connected to the CO2 sensor to improve the feasibility for acquiring measurements in these types of environments. 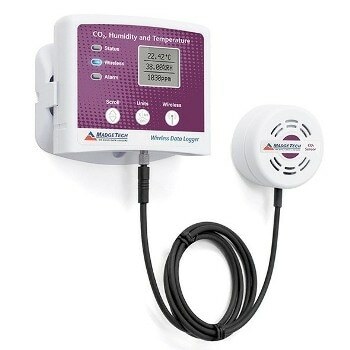 The use of this data logger can provide significant information on CO2 levels, thereby allowing all necessary personnel to improve ventilation systems as necessary, as well as identify and investigate potential energy saving opportunities. This data logger is also equipped with an LCD screen that provides users with an easy way to access current readings, as well as minimum, maximum and average statistics regarding all stored measurements. Additionally, the RFCO2RHTemp2000A also provides users with a series of unique features including configurable alarms, a battery life indicator and the ability to reset statistics without impacting any data collection procedures. Equipped with a convenient wall mount for the logger and a dual lock for the CO2 sensor is equipped, this data logger ensures secure placement and effortless mobility during all measurement operations. 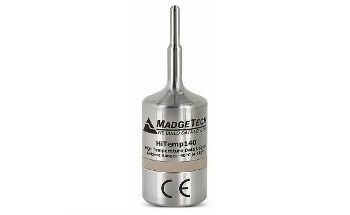 All temperatures recorded on the RFCO2RHTemp2000A can be expressed in °C, °F, °R or K, whereas all humidity measurements can be expressed as %RH, mg/ml, and Dew Point. Additionally, CO2 levels can be expressed as either ppm or as a percentage, depending upon the users’ preferences. All data and units can be viewed on both the LCD screen and the latest version of the MadgeTech Standard software, which allows users to easily analyze data and/or generate reports in graphs or tabular formats. Additionally, summary and statistics data can be exported into an Excel® document for further analysis. Note that the RFCO2RHTemp2000A data logger can be used as either a standalone data logger, or as a single wireless data logging system that can transmit collected data back to a central PC for real time monitoring. Additionally, the RFCO2RHTemp2000A can also be further expanded into a large-scale system that is comprised of hundreds of different data loggers. The RFCO2RHTemp2000A data logger is MadgeTech Cloud Services ready, thereby allowing users to easily monitor data remotely from any smartphone, tablet or internet enabled device.